- Destrel - - Right or Wrong ? This game will let you discover another facet of the lamb ! ! ! All lamb offals can be commercialized ? As a producer of ovine, which rank does France hold within the EEC ? Do you rather buy your meat in super or hyper markets ? Does the lamb meat has to be kept at the coldest place in your fridge ? Is France the first land of ovine meat consumers ? Is the moufflon the ancestor of the lamb ? Which is the number of lambs of French ovine livestock ? In France, which is the ovine meat consumption per year and per inhabitant ? 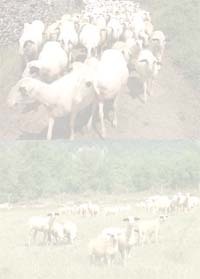 Is the South Pyrenean region the first region of France of ovine production ? DESTREL company only commercialises ovines ? Can you talk about lamb and sheep without differentiating them ?